Thermal expansion occurs as domestic water is heated. If left unchecked, the resulting pressure increase can cause relief valve discharge and other potentially unsafe conditions. Expansion tanks absorb this expanded water, keeping water pressure at a safe level. 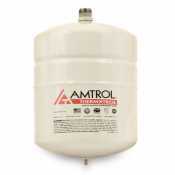 Canarsee carries a selection of Amtrol Therm-X-Troll tanks and well water tanks that will keep your plumbing system safe.